To support and broaden the technical education in the Gambia Global Energy will start a Technical School in Tujereng-South. 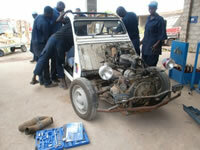 On a small scale we hope to train gifted boys and girls who are showing interest in the technical field. This will be a new combination in the Gambia of theoretical and practical education in one place. On the pictures you can see how we train our staff on various technical fields. 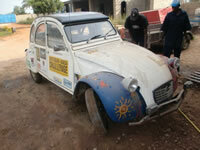 Our most recent project is “Project 2CV”. We bought a strong Citroen 2CV from the Amsterdam Dakar auction to be used to train the Global Energy staff on the basics of this technical simplified car. Believe me: they all enjoy it! 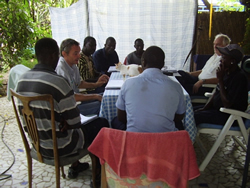 Through PUM Holland we invited an expert to train us on the new techniques and computers on generators. We have received the equipment and provide the service on testing and synchronizing generators and other engines.